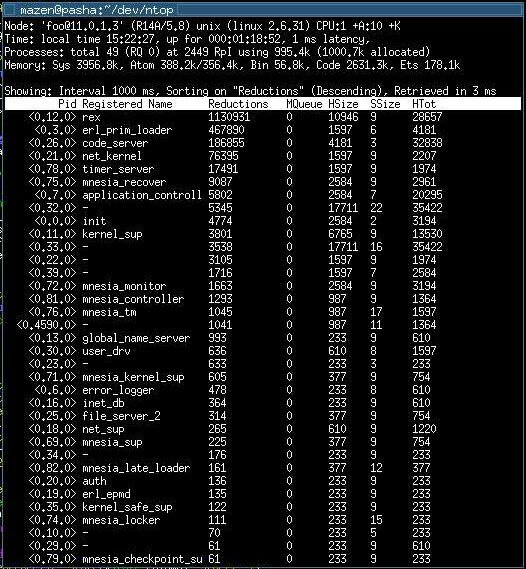 So the ntop application I released yesterday has received pretty nice feedback from friends and unknowns but apparently there is another ntop application out there; the “other” ntop is “Network Top” and is found at www.ntop.org. So I’m changing the name of my ntop to entop! It is a corny name… I know… but I liked the name ntop so this will just have to work + google doesn’t show anything software related when searching for entop (except for some Finish stuff which doesn’t look software related :D) so I just picked that name. The name in this post is old; the application is now named ‘entop’, just to clear that confusion. 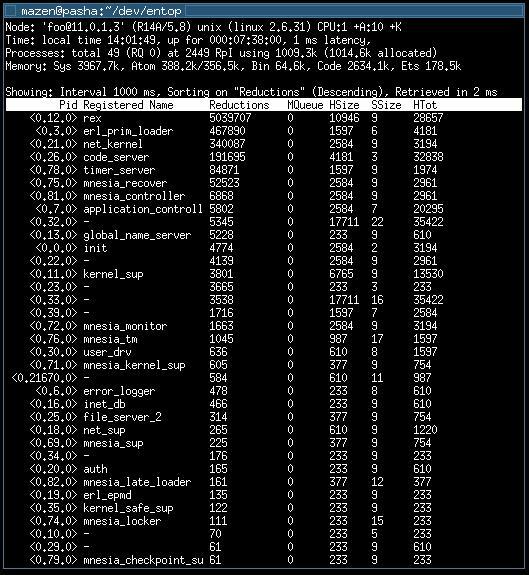 ntop is a tool which aims to be similar to the unix tool ‘top’ but instead of displaying the OS processes it displays the processes (and various information) of a given Erlang node. If you don’t know what ‘top’ is then see this wikipedia page. I wasn’t too sure of what information one would want other then what I put in it; I have only my own and my collegues’ experience in what we need when monitoring systems so to make sure that this can fit anyone I made sure to make the columns and headers customizable enough to print out different information (which might be more relevant to other people). I’ll go through how to write a different version and how to extend ntop in a different post. If you try it out then please let me know if you find it useful and if there is something missing or needed! I’m sure there are bugs as well and I’ll fix them as I go.